Ever want to be able to switch between windows quickly at the flick of a keypress? Yes you can do it with the Command + Tab shortcut that is build into OS X, but the problem is that it shows all applications not all windows open. Luckily there is Witch that fills in the gap. 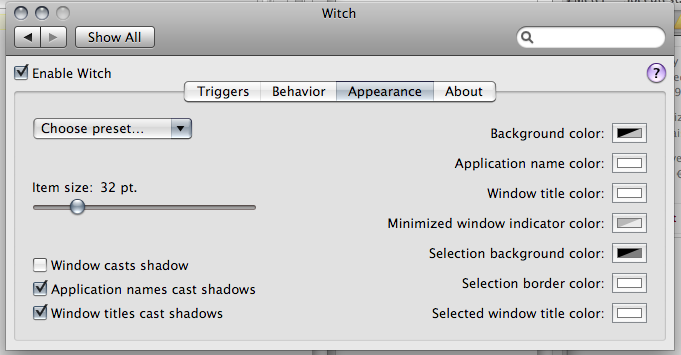 Witch installs as a preference pane in System Preferences and has quite a few configurations shown in the screenshots below. 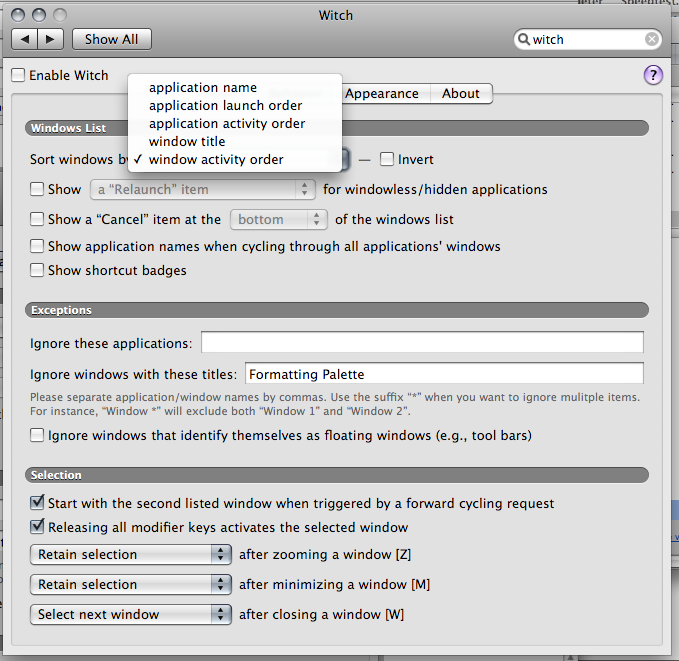 You can configure the shortcut used to activate Witch, however it can’t be remapped to replace the default OS X’s Command + Tab application switcher. Windows can be organized by application or window details (name / launcher / activity order) thus you are not constrained to a single configuration. 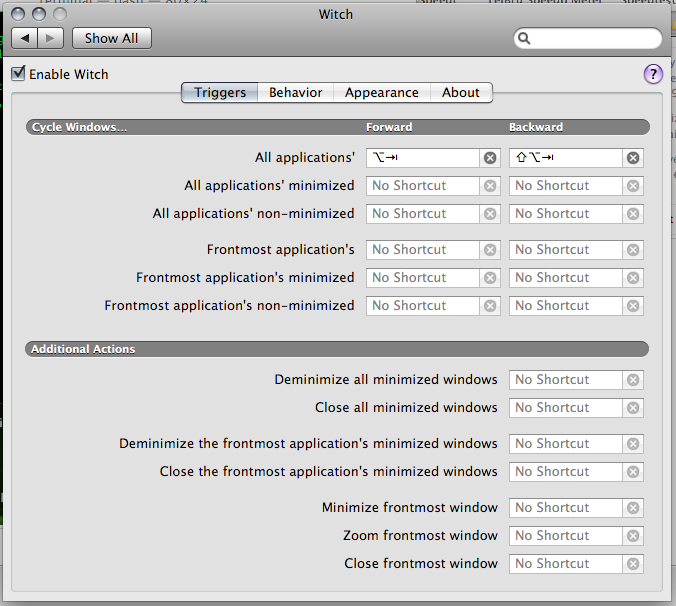 Shortcut badges, is a nifty feature, as it adds a keyboard shortcut to the Witch menu. A badge with a number will show up next to the application window and show in the screenshot above, and a single number can be pressed to activate the appropriate window: an added shortcut and time saver. On the down side, the application costs €9.95 (~US$15 / ~B$21), doesn’t show all windows and performance issues. While the application does not cost that much, it does annoy me that in order to get OS X to work the way I want it to, it seems I have to fork out more money for some application to fix the problem that shouldn’t even be there in the first place. 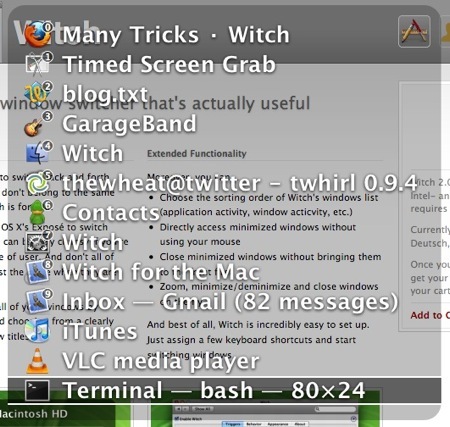 With regards to Witch now showing windows, I notice the help dialog (e.g. Finder > “Mac Help” menu item) and Google Chrome both don’t show up in the Witch menu. I think the Help dialog could be an OS X issue because it is not accessible via default OS X application switcher (Command + Tab) nor through any windows switcher (Command + `). Seems like the Chromium / Chrome issue is known and it’s strange as it does show in Command + Tab. With regards to performance issues, I find that if I don’t use Witch all the time (sometimes I still use Command + Tab), when activating the Witch menu it takes a while to appear and sometimes it doesn’t appear at all.